What is steam Agarwood and for what it is use? Why this Agarwood is steam? This Agarwood steamed to get the color to be black or dark brown, because this Agarwood is the material of Agarwood incense, Indonesian exporter export this Agarwood to Saudi Arabia, Yemen, and other countries. First this Agarwood came from jungle, this Agarwood is low grade, the color is white to yellow and light yellow, that is why they have almost no oil inside, and some times little. 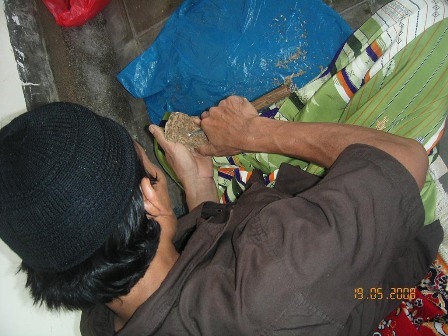 After it’s brought from jungle and the Agarwood is dried for 3-5 days, the Agarwood is cleaned and the shape is made by our Agarwood man = Agarwooder. After the shape is made, the Agarwood is ready to steam, in high temperature, steam, dry, steam, and dry, some time you could steam this Agarwood until 3 times. This product has no scent, because the buyer only needs its color, shape and the Agarwood material, the buyer put their own sauce or essence to this product.